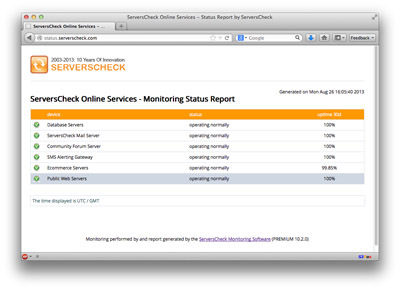 Status Report uploaded via FTP to http://status.serverscheck.com With ServersCheck sharing the status of your monitoring with your end-users has never been easier. Often traditional monitoring tools require you to have multiple user accounts if you want to share monitoring status with your business users. Next to the possible cost linked to it, it is not a smart approach. Giving users access to your monitoring platform, even when protected by user name & password, is a potential security risk. Who isn't tempted to see if they can get to see more by trying out a few combinations. That's why it is better to separate the monitoring platform and reporting environment. With our status reporting feature that is possible, even from within the freeware version. Using a simple configuration menu you can create as many status reports as you want. The reports are saved locally onto the host running the ServersCheck Monitoring Software. The reports are refreshed every minute. You can also publish them via FTP to a server. That is exactly what we did at ServersCheck. When you go to http://status.serverscheck.com then you'll be redirected to a simple web server hosting static status reports generated in near real-time and uploaded via FTP. Often internal users, customers or management want to have a report delivered every x time that shows the performance / availability of the infrastructure that you monitor. 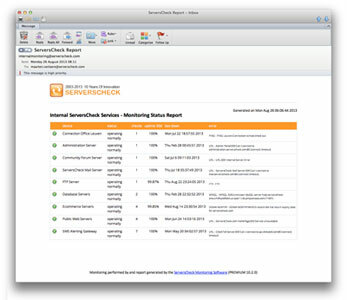 ServersCheck has created an email broadcast feature for its static reports. Simply select in the report builder which elements you want to include in the report (devices and/or groups), the start date and report broadcast interval and the email addresses to which the report should be sent.